We watch the Rick Mercer Report on a regular basis, and have always been intrigued by the alley where the rant segment on his show is taped. 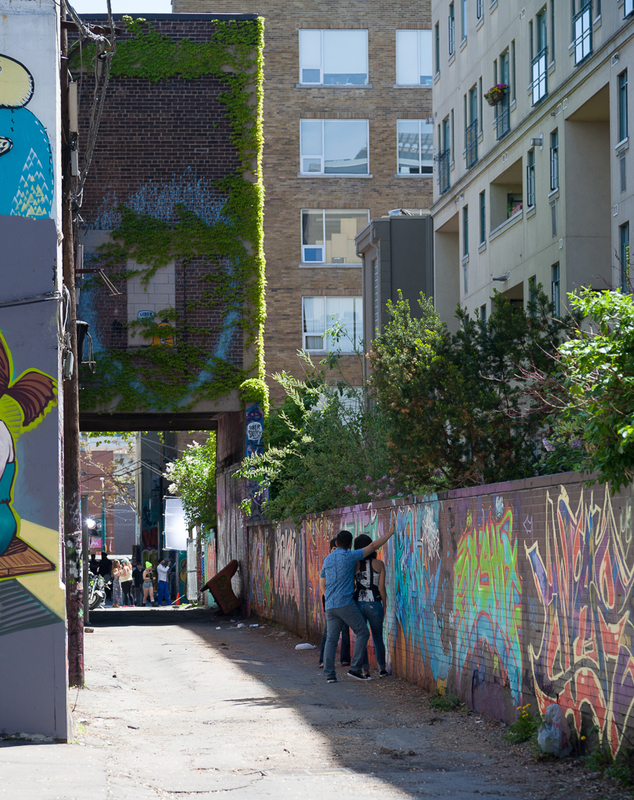 The location is popular with good reason, and a google search on Graffiti Alley or Rick Mercer’s Alley will provide you with all kinds of background information. The alley is formally known as Rush Lane, and runs east to west 1 block south of Queen Street between Portland Street and Spadina Avenue. The word alley conjures images of needles, garbage and unsavoury characters – but this alley couldn’t be further from that! Rush Lane has become a destination in its own right. Tourists come here to admire the artwork, and as we witnessed during our visit, a music video was being filmed at this location while a young couple was being photographed with the graffiti as a novel backdrop (the film crew (background) and couple (foreground) can be seen in the picture at left. There are many other options in Toronto to see street art, but this 1 kilometre alley, and multiple offshoots, offer a lot to see in a compact area.